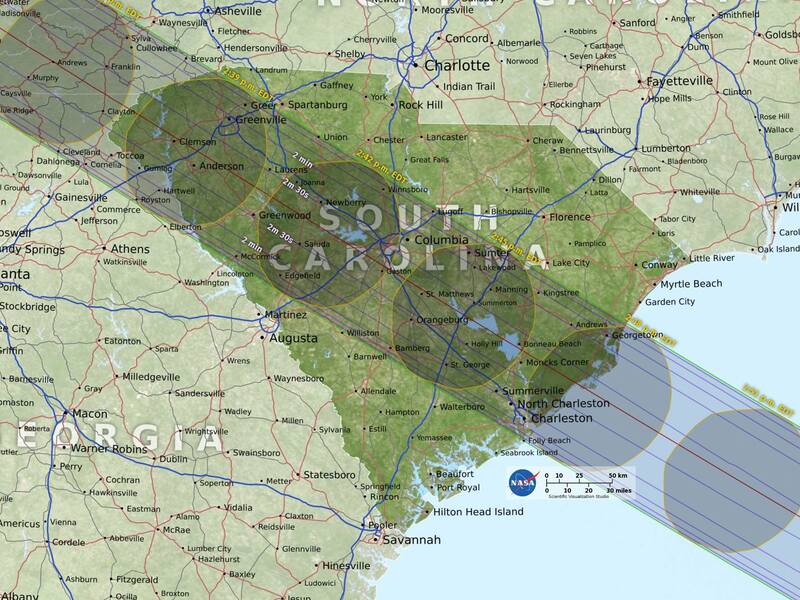 Home › Coastal South Carolina › 2017 Eclipse Shows Meteorological Effects Along the Charleston, SC Coast. 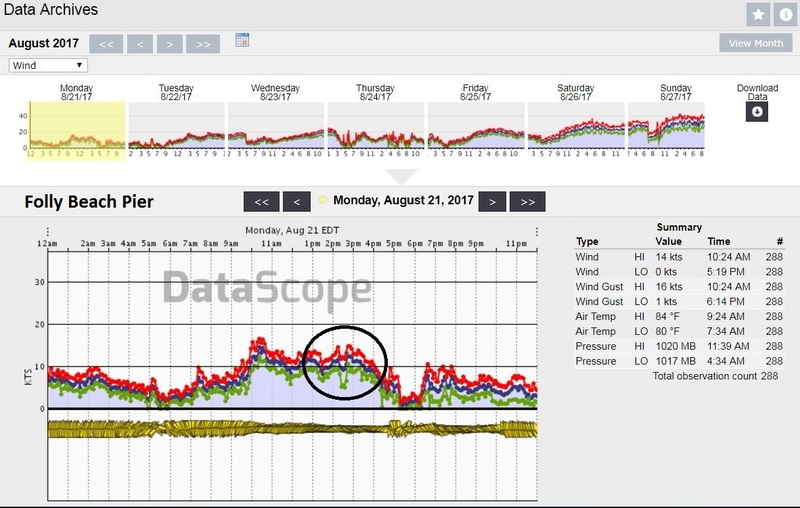 2017 Eclipse Shows Meteorological Effects Along the Charleston, SC Coast. There is no doubt how cool the Eclipse 2017 was for folks that lined up in its path to see. I was one of the fortunate ones along coastal SC that was able to get a good view of it..and WOW! It was quite the experience! 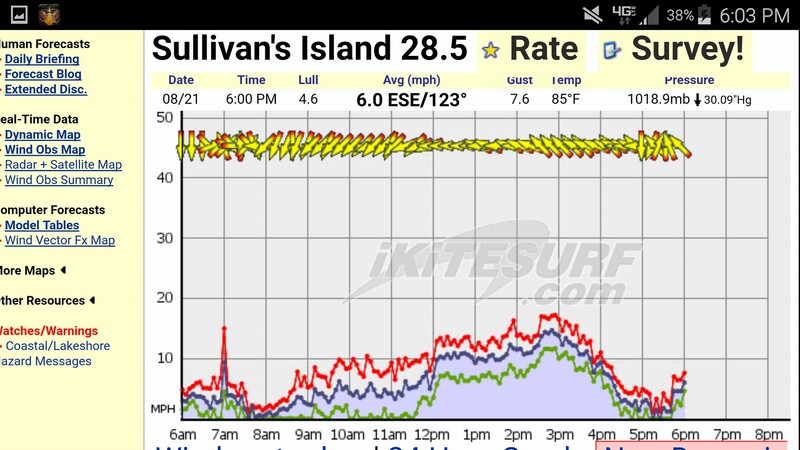 I was at front Beach, Sullivan’s Island at Station 28.5 overlooking the ocean and paid very close attention to the wind and weather while there. 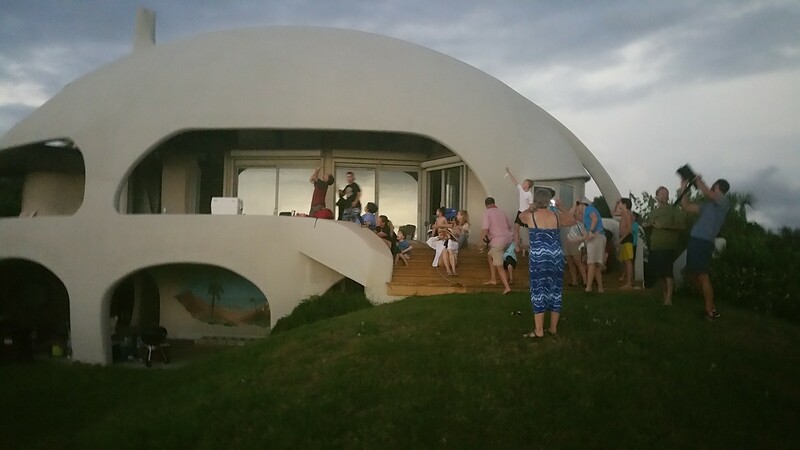 We were at the “Egg Shell” home..also known as the “Hurricane Home”. 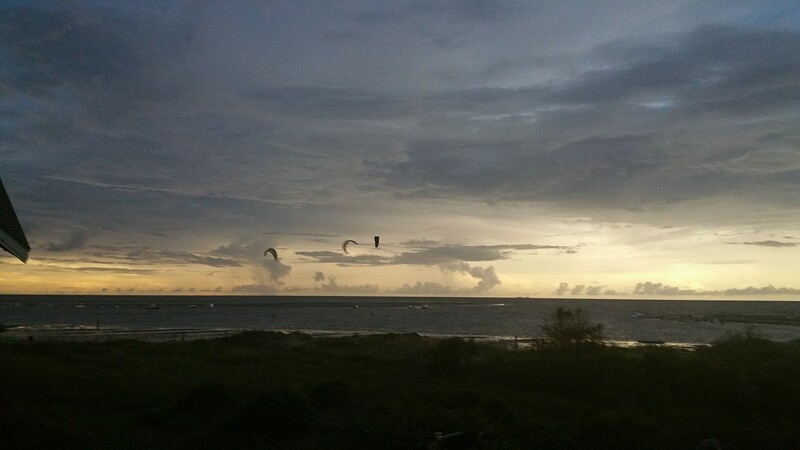 One really unique thing I noticed (with assistance from watching fellow kiteboarders on the water) was how the wind steadily picked up as the sun became more and more shadowed. The speeds actually peaked right during the total shadowing phase of the sun. 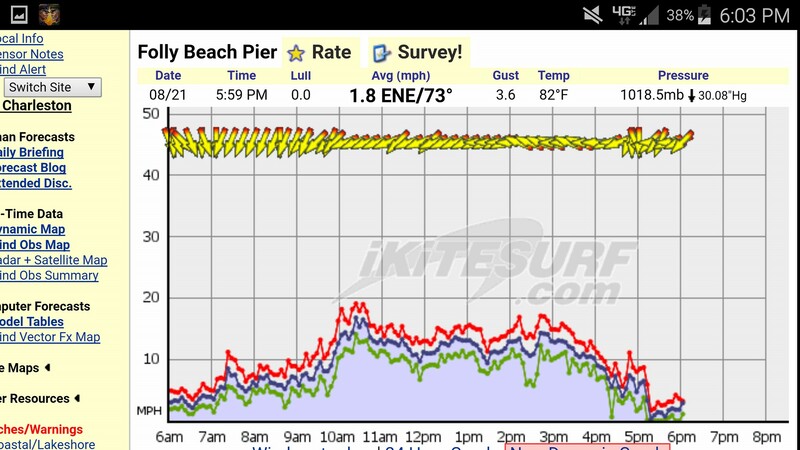 Afterwards, the winds steadily fell to very light speeds. 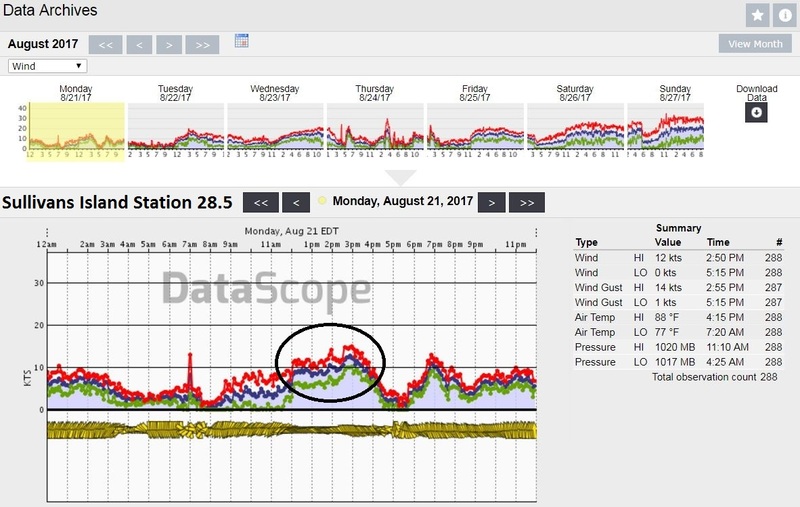 Here are the wind graphs from Datascope and iKitesurf to all 3 local beaches in the Charleston area that fell under the total darkness…being Isle of Palms, Sullivan’s Island and Isle of Palms. 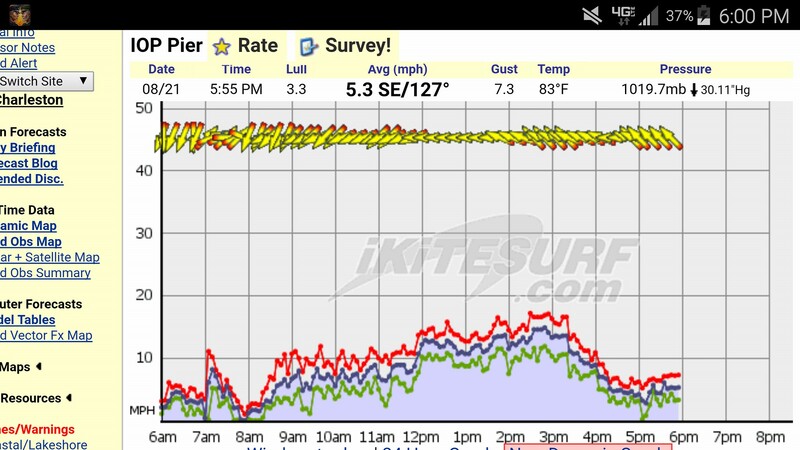 Notice that all the winds turned E/SE for the start through end of the phasing (started shadowing ~12:00pm with peak darkness at 2:45pm, then sun coming back out through 5pm). 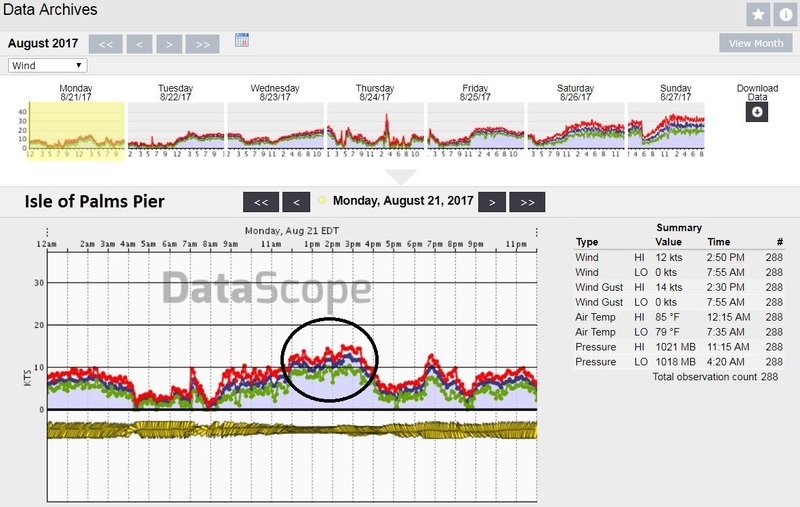 The Folly Beach sensor is tricky because it had earlier T-storms that fizzled out, was on the very edge of the darkness line…and it also has a spire at the end of the pier which blocks winds from the SE, so you see a dip in the winds that is not actually present. So, ignoring the downward dip just before peak darkness, we can assume the average continued to inch up to the peak shadowing at 2:45pm. The other things noticed were thunderstorms lined up along the Sea Breeze front inland gave off quite a lightning show as the shadow grew over the area. On the way to the beach late morning, I checked the clouding, which showed that typical bullish cumulonimbus structure (anvil shaped thunderheads) beginning to develop inland. However, driving back over the Isle of Palms connector after the peak event, I noticed the cloud types had that purplish cumiliform tower-like structure, which generally signifies a nocturnal or nighttime convective pattern where a warm layer is trapped aloft. Basically, the sun being shadowed interrupted the (radiational) heating process and caused the atmosphere to sort of “switch” to a night time pattern. Unfortunately, the Charleston radar was down so I downloaded Level II radar data from the Columbia, SC NEXRAD site to update here. 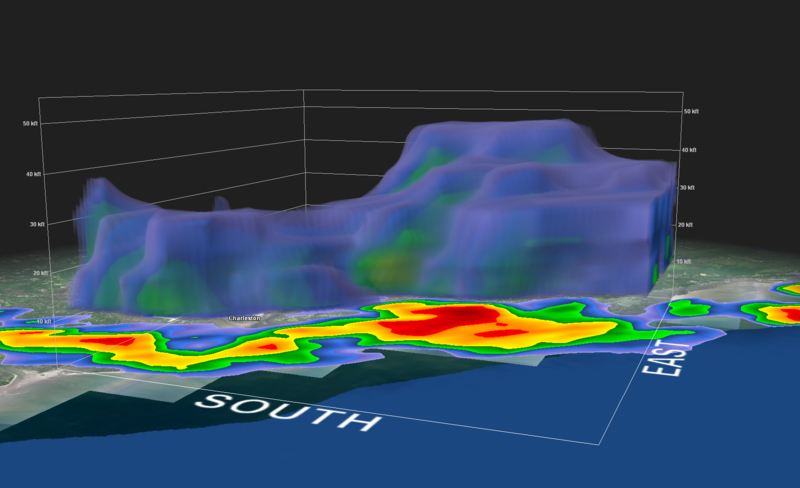 Quite a lightning show inland along the Sea Breeze front. 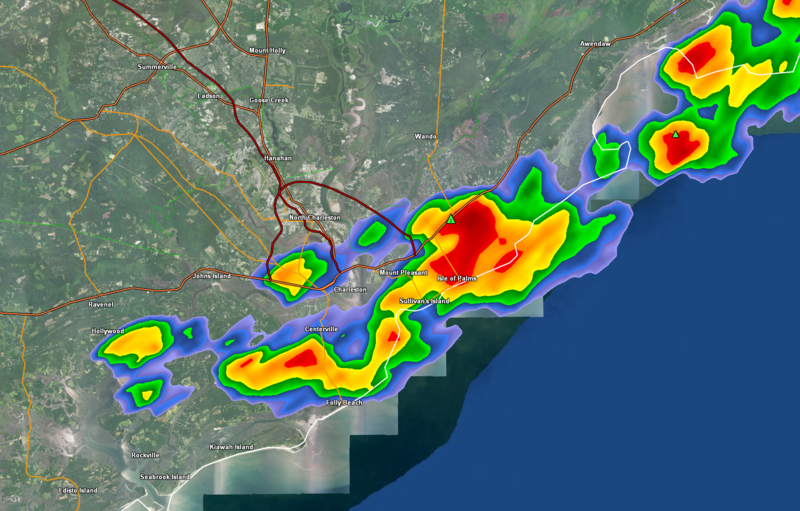 Storms advanced towards the coast a bit earlier as the Sea Breeze retreated. 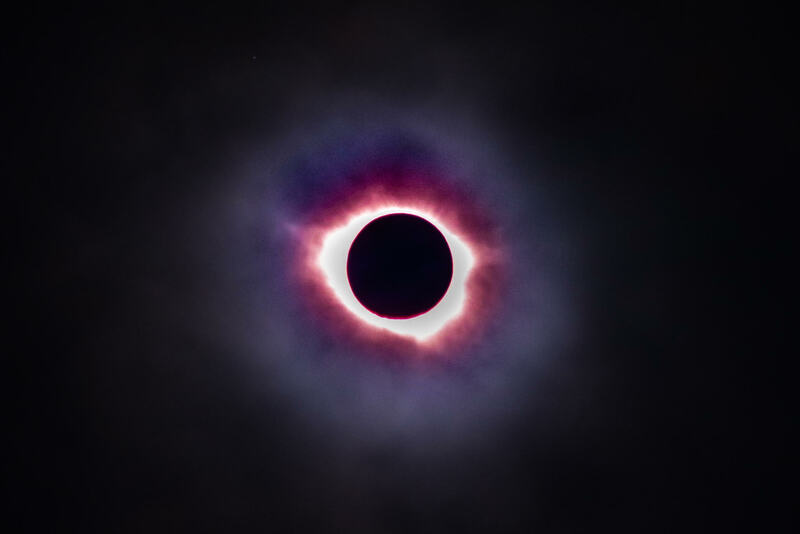 I also noticed that where I live following the eclipse into the late afternoon and evening, that the summer daytime Cicadas, the brush bugs known for their loud screeching sounds that drone on-and-on all day, were quiet. The evening crickets were quietly chirping and the birds were not out and about. This was very much a nocturnal shift in the wild life and it stayed that way through sunset. I also was told of farm animals going back to the barns and hunkering down as they would at night time as well. Pretty neat! 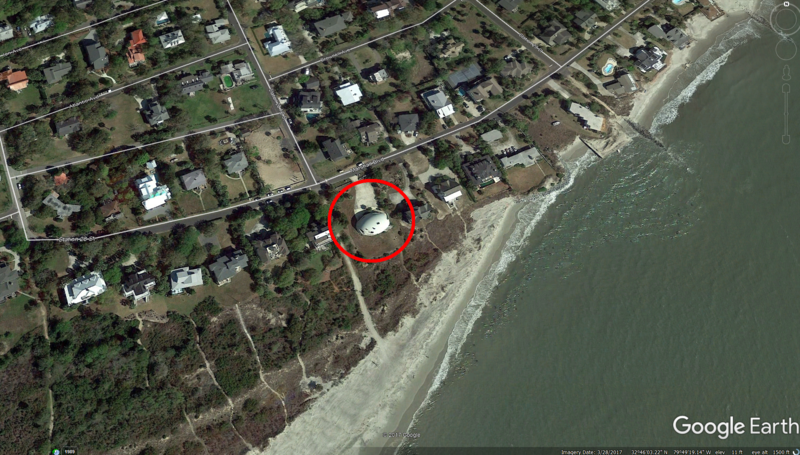 Here is a GREAT drone video from a friend of mine Michael Royal who panned around his home at Sullivan’s Island Station 28.5 during the eclipse. All-in-all…this event did not disappoint on any level. 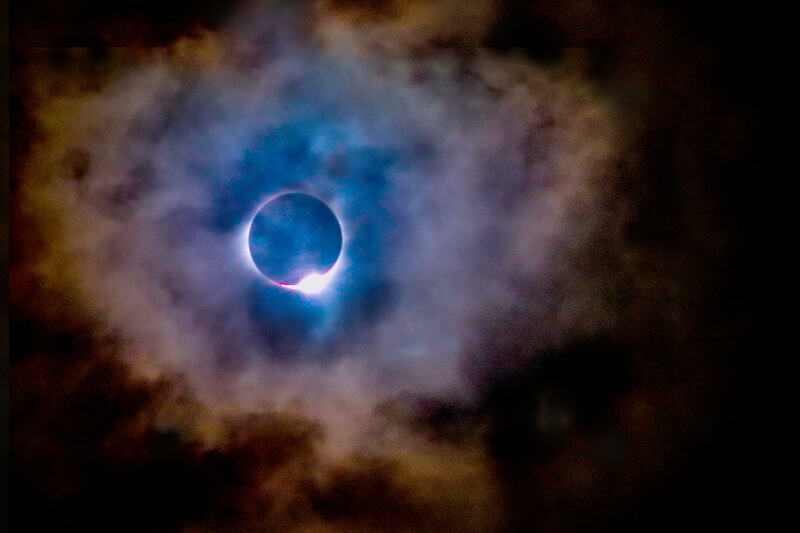 Definitely worth seeing these full solar eclipses. And guess what? The next one will be in 2024 across the United States. 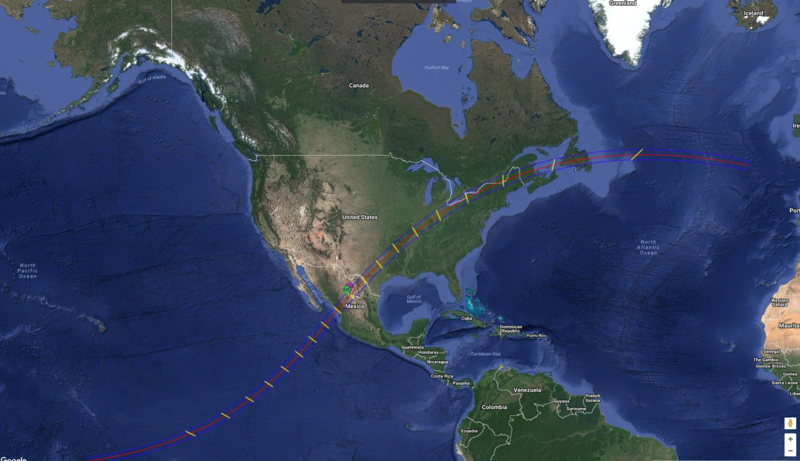 ‹ West Coast Wind Blog: Tropical Storm Lidia makes for fast changing wind forecasts.